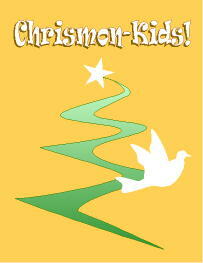 Make an Advent Tree using our Chrismon-Kids book! It contains 32 basic Christian patterns to decorate your tree! What you need: 24 Christian pattern symbols, green felt, white stiff felt or craft foam. A variety of gold trims such as gold beads, ribbon, bric-a-brac, paint, etc. What you do: On the first day of Advent cut the green felt into a tree shape. (Cut the ornaments beforehand, then arrange them on top of the felt to see how large your tree needs to be. You can enlarge or reduce the size of your patterns too.) Hang tree on a wall or door. Each day going towards Christmas day, decorate one ornament to go on the tree. Chrismon ornaments are decorated using gold trimmings. (Attach ornaments to the felt tree with Velcro. The loop side of the Velcro stuck to the back of your ornament is usually sufficient to adhere to the felt.) On Christmas Day place the Baby Jesus in the Manger ornament on your tree. Click here to learn more about Advent.